He Jiankui, a Chinese scientist and an associate professor at Southern University of Science and Technology apologized before 700 people who gathered during the Human Genome Editing summit hosted at the University of Hong Kong. Jiankui was at the center of a heated debate over what he perceived as the first genetically modified children in the world. In his speech, he did mention unknowingly as he tabled his findings on Wednesday. He admitted that the information was leaked in his very first statement. He also mentioned that his study was already submitted to a scientific journal for a proper scrutiny though he didn’t disclose the name of the journal. “I did this study privately without the knowledge of my University,” He added. 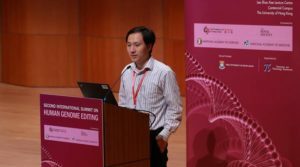 In the video which went viral early this week, Jiankui said that he applied gene-editing technology called CRISPR-Cas9 to change the genetic component of twin girls who were born this month. He mentioned that the gene editing which he did would act as a vaccine to protect the girls against HIV infection. The girls are at a lower risk of contracting this deadly virus which causes AIDS. However, his research was criticized by the group of scientists and the Chinese government citing that the hospital where he carried out his research was none-existing and that the approval forged. Even the summit organizers were not aware of the Jiankui’s study until it eventually came out during the summit. This statement was confirmed by Robin Lovell-Bridge who was moderating the conference. CRISPR-Cas9 is a new breakthrough in genetic engineering which lets the scientists transfer DNA. This new technology is a hopeful remedy to some of the deadly disease. However, there is a debate about the safety and ethics involved in using it. From an open letter written by the scientists stated that the practicality of using CRISPR-Cas9 in modifying human embryo is yet to be justified but until then, it is a dangerous practice. Jiankui’s research was based on the genome sequencing, bioinformatics, and gene modification according to the biographical information posted on the summit’s website. The site also gives his educational background as a postdoctoral researcher who earned his Ph.D. at Rice University in Houston. He uses Stephen Quake lab at Stanford University.